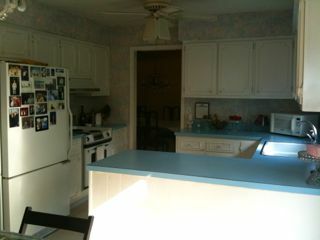 I have always loved to cook, and especially to bake, and I have always done so in an ugly kitchen (with the exception of my parent’s home). When my son, Addison, came home from college last summer, where he studies architecture, he said his studio professor recommended his students do any possible remodeling work during the summer for the experience, even if they didn’t get paid. 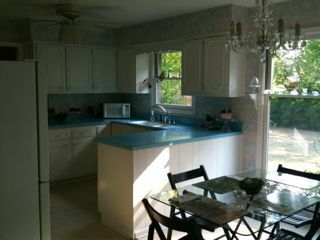 Ironically, I told him I had been thinking how nice it would be if we could remodel our 1974 kitchen. Not wishing to miss a golden opportunity I ask if he was game and thus began our story. 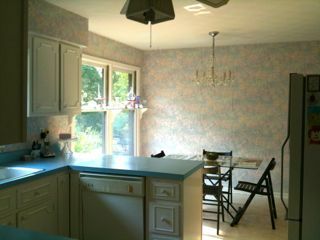 Yes, as is quite obvious from the photos my kitchen was in desperate need of a major make-over. 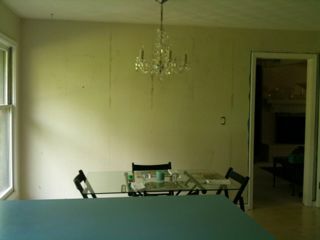 The first order of business was to remove the shiny, vinyl wallpaper. My daughter, Maddie, agreed to help and so our summer project was off and running. 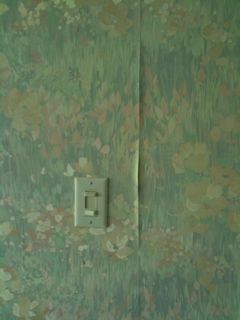 Removing wallpaper can be a long, tedious job. I have tried different methods, but none with much success. A friend recommended fabric softener in a spray bottle, with a little water added. 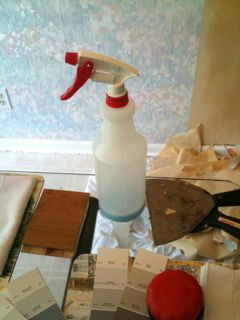 She said to score the wallpaper, generously spray the wall with the mixture, let it sit a while and it would come right off. With the aid of wide scrapers, my two children and a little elbow grease for the most part, it did. Thanks, Faith, for the good advice. 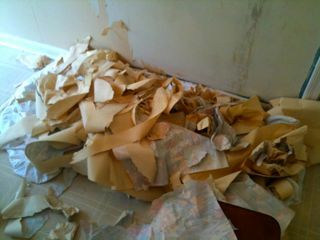 I’m not saying it was cake, removing wallpaper is still a messy job, but it worked better than any other method I have tried. I would, however, recommend using unscented fabric softener as the smell, even a nice smell, can be overwhelming after a while. 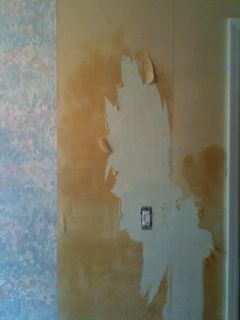 We had just begun and I knew there was a long road ahead, but just having the ugly wallpaper gone fueled my motivation. Now that we had made a clean spot there was no turning back.